On Tuesday, October 28, after LLAM’s fall board meeting, the Thurgood Marshall Law Library hosted a brown bag lunch and program featuring two presentations by Gail Warren, Director of the Virginia State Law Library and Treasurer of the American Association of Law Libraries. In the first, Ms. Warren looked back at the predictions made by AALL’s Special Committee on Law Libraries in the Digital Age in its 2002 report Beyond the Boundaries: Report of the Special Committee on the Future of Law Libraries in the Digital Age. This report provided impetus for the formation of Legal Information Preservation Alliance in 2003, and the Chesapeake Digital Preservation Group in 2007. 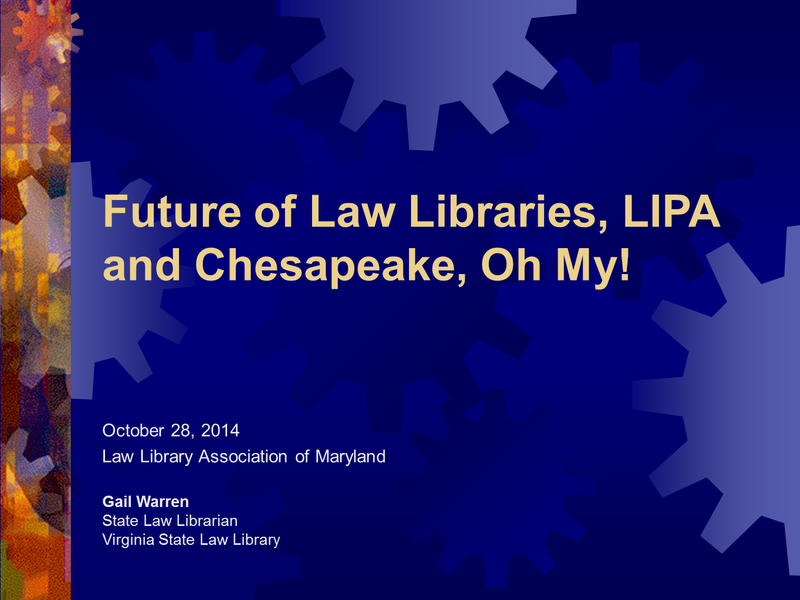 Predicting the future of law libraries is more art than science, and her frank assessment will be useful for those members who are called upon to make long term planning decisions in their own shops: Beyond the Boundaries, LIPA and Chesapeake (slides). 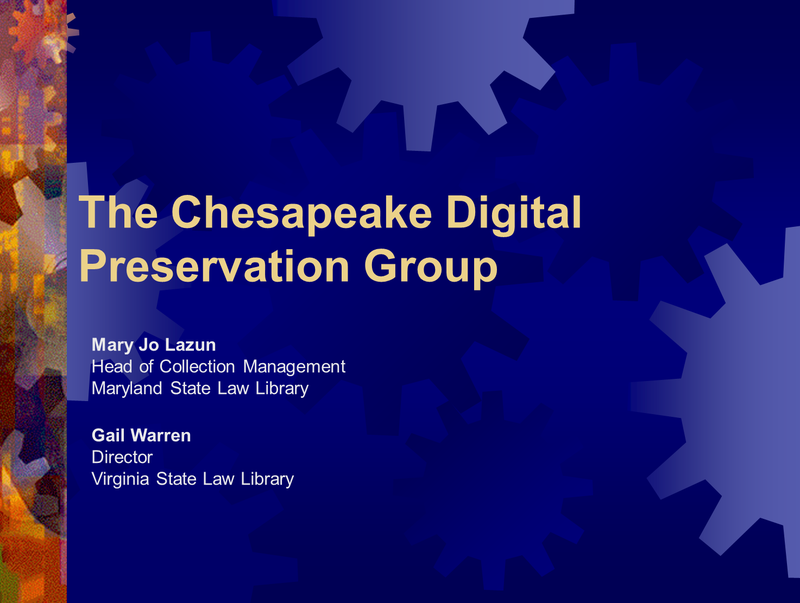 In the second presentation, Ms. Warren was joined by Mary Jo Lazun, Head of Collection Management at the Maryland State Law Library, and Joan Bellistri, Director of the Anne Arundel County Public Law Library, for an update on the work of the Chesapeake Digital Preservation Group. The Chesapeake Digital Preservation Group is a collaborative effort of Legal Information Preservation Alliance members to address the challenges of born-digital legal information shared by the Virginia and Maryland State Law Libraries, Georgetown University Law Library, and Harvard University Law Library: The Chesapeake Digital Preservation Group (slides).